HOPEFUL: Mr Francis Toh, owner of First Overseas International Matchmaker, and his wife, Madam Rachel Nguyen (closest to him), with some prospective Vietnamese brides at his office in Katong Shopping Centre. SINGAPORE - As you walk along the corridors at Katong Shopping Centre, you might encounter an unusual shop nestled among the maid agencies. The women inside it are well-dressed. They wear lipstick and have powdered faces. Outside his shop is a signboard with the words "bride" in Chinese characters. Despite that, customers still are mistaken. "People see ladies sitting in my office all day and immediately assume they are maids. "Can't they see that my ladies are dressed so nicely, with make-up and their hair done up? 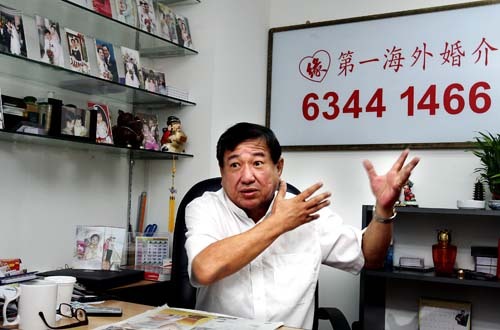 These women are looking for husbands, not employers," says Mr Francis Toh, 58, the Singaporean owner of First Overseas International Matchmaker. There are at least 17 such marriage agencies in Singapore, going by a check of the Yellow Pages.. Some specialise in matching professionals and executives. 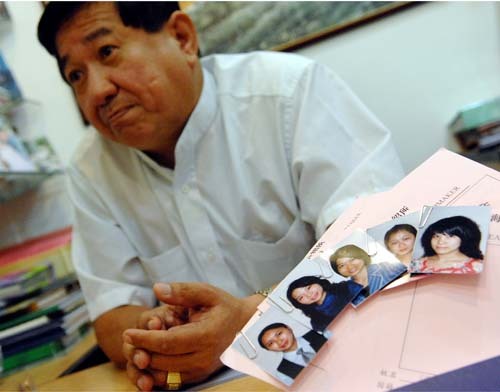 Others, like Mr Toh's, pair local men with foreign brides, mainly from Vietnam and China. Mr Toh's clients are men who typically have little luck with local women. They are usually blue-collar workers in their 30s to 50s with little education. Their preferred mate? Young, submissive and foreign. The women, in turn, are usually farmers' daughters, aged 18 to 25. They come from the poor, rural areas in southern Vietnam, such as Tay Ninh and Binh Thuan, and regard Singapore men as a way out of poverty. Mr Francis Toh, owner of First Overseas International Matchmaker, and his wife, Madam Rachel Nguyen, with some prospective Vietnamese brides. Photos of clients who married his girls line the wall behind his desk. 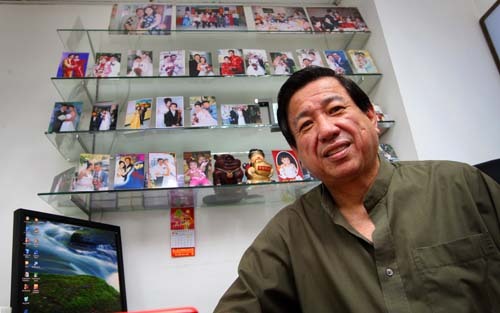 Mr Toh with photos of prospective brides. 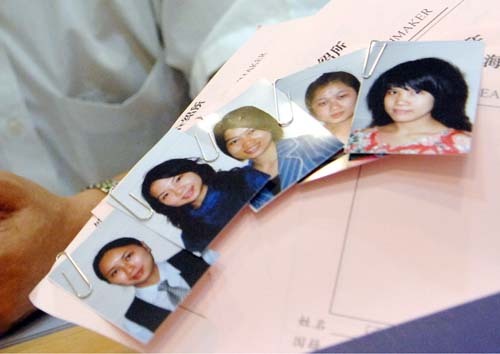 "If a man wants to marry them, he pays the agency $6,800 in cash or cheque," said Mr Toh. Mr Francis Toh said he does not force the girls to sit in his office, but they do this so as to meet prospective husbands. Passing men sometimes glance at the women sitting in his office. Mr Francis Toh with a Vietnamese woman who called off her wedding with a Singaporean man after he allegedly threatened her with a knife and forced himself on her. 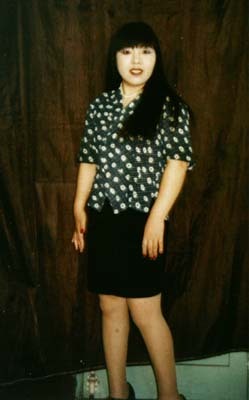 Ms Zhang Xue Hong, 42, wants to find a husband in Singapore with an income above $3,000 and owns a private property. She went to a matchmaking agency and failed to find one. 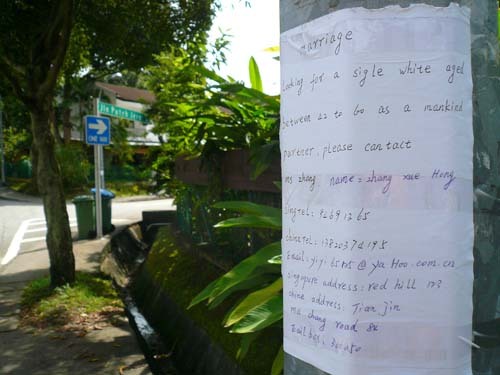 She started putting up notices on lamp posts along Taman Warna and other streets in Holland Village.